Astronauts lookingdown on Earth from space have long said the view is tremendous, but it is also comeswith the revelation that of all the planets in the cosmos, there is only one worldthat humanity calls home. ?Our planetis our spaceship,? said NASAastronaut Sandra Magnus, who recently returned to Earth after spending about4 1/2 months in space. ?It looks very fragile from here, and it?s very easy totake it for granted when we?re living on it, when it seems so big and somassive. But it?s not. It?s very small and very fragile.? Magnusreturned home in late March with a newperspective of her home planet, one that came just in time for EarthDay today. ?When youlook out the window, you notice how incredibly thin our atmosphere is, how sucha fragile shell of air we have that surrounds our planet and makes ithabitable,? she said before leaving the station. ?And you can read that in abook, but until you see it it doesn?t strike home.? Magnus isnot the only astronaut to marvel at the sight of her home planet from afar. The firstastronauts ever to see the entire planet as a distant orb in a sea of black spacewere the three Apollo 8 astronauts, who took the iconicimage of Earth rising over the limb of the moon in December 1968. ?The amazingpublic perception of that stunning photo gave everybody an awareness that the Earthwas an oasis out there in a very barren, harsh cosmos,? said former astronautThomas Jones, a planetary scientist and co-author of the book ?Planetology.? ?Ithink those images became the icon of the environmental movement in its earliestphase.? Othermissions and robotic probes have beamed home views of Earth from more distantrealms, including the surface of the moon and Mars, through the rings of Saturnand from more than 4 billion miles away, which revealed the planet as a ?paleblue dot? in space. ?That?s whatthe space program gives us is the ability for everybody to share in the astronauts'vantage point,? Jones, a four-time spaceflyer, told SPACE.com. Meanwhile, Japan?sKaguya lunar orbiter has been recreating the Apollo 8 Earth rise view using itshigh-definition cameras since it arrived at the moon in 2007. 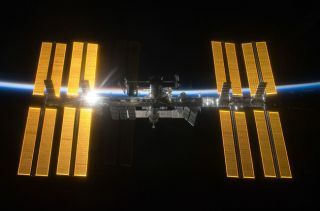 There arethree astronauts aboard the International Space Station right now: Russianstation commander Gennady Padalka and flight engineers Michael Barratt of NASAand Koichi Wakata of Japan. Their Expedition 19 mission began in late March. While hisnearly seven-month mission is just beginning, Barratt said the impact of seeinghis native planet far below has already had an impact. ?There?s nodoubt, when you look down at the Earth from here, you?re just overwhelmed byhow beautiful it is,? Barratt said this week, adding that two things immediately jumpout. ?One is how much you miss it, and two, is how much you really want to takecare of it as best you can.? Magnus saidthat when a person gazes at the Earth, there is a sense that humanity and alllife as we know it are completely dependent on a single planet and its thinatmosphere. ?It makesyou think about our planet as a whole system,? Magnus said. ?We?re all there togetherliving together as human beings and other organisms and we have to take care ofeach other. ?